Advocating for reforms that affect our democracy. Learn about our recent legislative priorities. The legislative session is fast paced. For more frequent updates, follow us on Twitter or like us on Facebook. If you’d like to help us by submitting testimony on one of our issues, please email hawaii@commoncause.org for more information. On June 25, 2018 Governor Ige released his “Intent to Veto” list. Included was SB2992, which would have weakened campaign finance disclosure laws. If enacted, signs and banners, in support or opposition of a candidate, would no longer be required to have the “paid for by” disclaimer on them. The public would no longer be able to identify the sources of these campaign materials without having to do additional research. We believe that in this post Citizens United world, coupled with the “fake news” phenomenon, it is more important than ever to identify sources of campaign materials, including signs and banners, and are glad this was vetoed. HB1401 HD1 SD1 CD1 which establishes Vote By Mail as a pilot program for Kauai County in 2020 was signed by Governor Ige and is now Act 182. This is a promising first step in modernizing our elections. The 2018 Hawaii State Legislative session ended on May 3. We’re proud that after four years, Vote By Mail (HB1401) has finally passed the legislature — as a pilot program for Kauai in 2020 — and will be sent to the governor for consideration. However, the session wasn’t all sunshine and roses, especially, since legislators have taken to shady practices like “gut and replace” to circumvent the legislative process and essentially cut the public out of the conversation. Please read Common Cause Hawaii’s 2018 legislative highlights to learn more. Vote By Mail. We need to make voting more accessible, convenient and secure for everyone. The original intent of this measure was to establish statewide mail-in voting. The bill was modified during conference committee and establishes a pilot program for Kauai County in 2020. Despite the changes, we are hopeful that this pilot program is the first step in implementing Vote By Mail throughout Hawaii. Ethics. Our democracy depends on strong ethical standards. This means making sure everyone plays by the same rules. One of the most important tools to help avoid conflicts of interest are financial disclosure statements, for elected officials, certain state employees, and board and commission members. Thanks to members’ support, we were able to stop bills that would have redacted these disclosure statements, which would essentially have rendered the disclosures meaningless. SB2609 Requires certain information on the financial disclosure statements of non-paid volunteer members of state boards and commissions are deemed to be public records under section 85-7(d)(8), Hawaii Revised Statutes, to be redacted. (SB2609 HD1, Dead for 2018) Civil Beat’s coverage. Article V Constitutional Convention. The unknowns surrounding a constitutional convention pose an unacceptable risk, particularly in the current polarized political climate. Most concerning is that there is no language in the U.S. Constitution limiting an Article V convention to one issue. That means that a constitutional convention could easily become a free-for-all for delegates to essentially rewrite our governing document. Read our op-ed here. Access. The public expects and deserves timely access to public records. Unfortunately, there are major issues at OIP, like an average wait time of two years to resolve complaints (click here to read OIP’s rebuttal and Civil Beat Law Center’s rebuttal). While there is no silver bullet to resolve these issues, we believe that OIP needs to be adequately funded (see Hawaii Public Radio’s story). Thanks in part, to our members’ support, OIP’s budget request for this fiscal year was included in HB1900 CD1 (the state budget bill). We look forward to continuing to work with OIP, the public, media, and other stakeholders as we look for ways to address issues that may be contributing to these delays. We also deserve and expect access to the state capitol. While we understand security improvements at the capitol may be needed, this should not come at the expense of public access. The community, including many of our members, spoke against a measure that would’ve greatly restricted the public’s participation at the capitol. Campaign Spending. We support the Campaign Spending Commission’s 2018 legislative package. These “housekeeping” bills will close loopholes and make needed updates that are long overdue. Other. Public Private Partnerships (3Ps) are supposed to help make capital improvement projects “more cost-effective and efficient.” However, 3Ps are an idea popularized by ALEC and cities and counties across the country have found 3Ps to have the opposite effect. Automatic Voter Registration: is a small technical change that would automatically register eligible citizens who apply for/renew their Hawaii Drivers’ License/State ID unless they choose to opt out. Information would be electronically transferred from the licensing agency to election officials, ensuring the registration process is convenient, accurate, and secure. Unfortunately, these proposals are dead for 2018, as legislators prioritized Vote By Mail. While we would have preferred to pass AVR this year, this will give the Department of Transportation and the Office of Elections time to follow through on their agreement and implement a data transfer system that will allow the two agencies to share information electronically. Ethics: Trust in government is more important than ever. Strong ethics laws help to foster this. We are very disappointed that none of the Ethics Commission’s bills survived. Access: The public expects and deserves timely resolutions to complaints when trying to access public records. While we’re disappointed these bills did not survive, this does not mean that community collaboration and discussion must stop as we continue to search for ways to resolve these issues. Campaign Spending. In today’s post Citizens United world, it is undeniable that money influences politics. This, coupled with the “fake news” phenomenon, has made it more important than ever to be able to identify the sources of campaign materials, including signs and banners, and to identify whether the advertisement was approved by the candidate. We believe that in this age of misinformation we should be increasing transparency, not reducing it. We support the Campaign Spending Commission’s 2018 legislative package. These “housekeeping” bills will close loopholes and make needed updates that are long overdue. We’re disappointed that most of the Commission’s bills did not survive. Other. As we’ve previously mentioned there has been terrible procedural practices this year. Particularly popular are “gut and replace” and “Frankenstein bills”. We’re currently reviewing bills that have made it out of Conference Committee and will be sent to the governor for consideration. Please sign up for our email updates to stay up to date on our work, combating these terrible practices. We’re at the the midway point for the 2018 Hawaii State Legislative session. Crossover is the deadline for bills to pass 3rd reading and “crossover” to the other chamber, where we start the hearing process all over again. Read on to learn how our bills are doing. Learn more about the need for and how to take action in support of Modern Elections Hawaii here. Vote By Mail: a ballot is mailed to every registered voter, no request or application is necessary. Voters are then able to return their ballot via mail or at a drop-off location; or cast their vote in person at early voting centers or service centers on Election Day. Unfortunately, these proposals are dead for 2018, as legislators are prioritizing Vote By Mail. While we would have preferred to pass AVR this year, this will give the Department of Transportation and the Office of Elections time to follow through on their agreement and implement a data transfer system that will allow the two agencies to share information electronically. Redistricting: The 2020 census is fast approaching, which is followed by reapportionment-when election districts are redrawn. To ensure there would be a partisan balance our constitution requires the Senate minority party to appoint members to the Redistricting Commission. Currently there is no minority party in the Senate. We support solutions to maintain this partisan balance to ensure fair maps for all. Ethics: Trust in government is more important than ever. Strong ethics laws help to foster this. Access: The public expects and deserves timely resolutions to complaints when trying to access public records. We should also be using technology to increase access and civic engagement. Campaign Spending: We support the Campaign Spending Commission’s 2018 legislative package. These “housekeeping” bills will close loopholes and make needed updates that are long overdue. Bills that aim to decrease transparency and public access to information. In addition to bills we’ve identified that fall within our purview, we also keep an eye out for procedural issues, like “gut and replace” and “Frankenstein” practices (inserting contents of unrelated bills). Using these questionable practices and shortcuts, decreases the opportunity for the public to weigh in, and for legislators to discuss and deliberate. If you see any of these, please let us know, email us at hawaii@commoncause.org. The Hawaii State Legislature runs on a biennial system, meaning that bills introduced in odd number years are technically still “alive” and are “carried over” into even number years. This means bills introduced in 2017 can be picked up at the point it “died” during the 2018 legislative session. While this doesn’t occur that often, we’re keeping an eye on those bills just in case. Click here to read about our 2017 priorities. 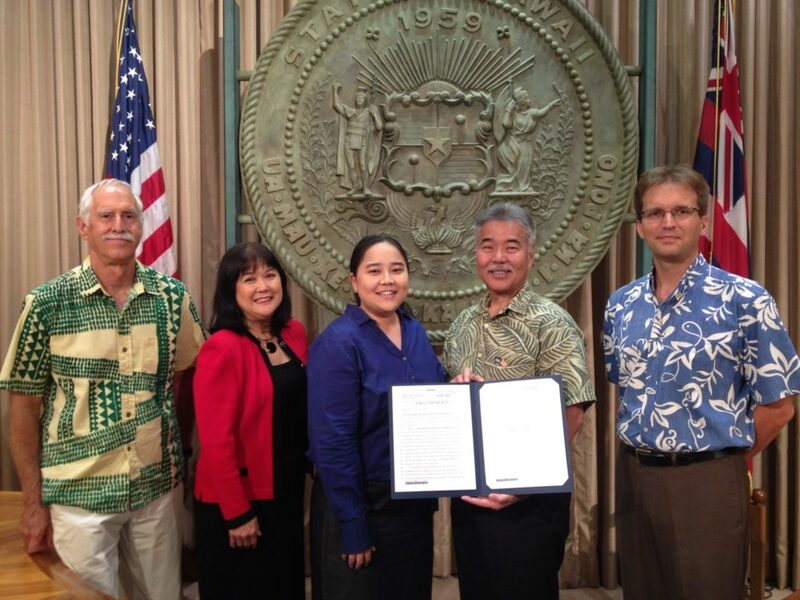 Once again, the dedicated Common Cause Hawaii team poured over the thousands of bills that were introduced. Below are our top priorities for 2018, some of the bills we support, and bills that are potential threats to our democracy. HB2552 / SB2232 Establishes an automatic voter registration system in Hawaii by allowing all applicants for a driver’s license, provisional license, instruction permit, or civil identification card to either clearly decline to register to vote or fill out the voter affidavit on their application at the time their application is processed. HB2542 Enacts voting by mail uniformly across all counties for all elections commencing in 2020, and allows any election to be conducted by mail prior to the 2020 primary election, in whole or in part, as determined by the chief election officer or county clerk, as appropriate. Establishes a limited number of voter service centers that would remain open from the tenth business day preceding an election through the day of the election to receive personal delivery of mail-in ballots, accommodate voters with special needs, offer same day registration and voting, and provide other election services. Allows for additional places of deposit for personal delivery of mail—in ballots. Appropriates funds for the implementation and administration of the election by mail program. Requires the office of elections to submit a report to the legislature prior to the convening of each regular session from 2019 through 2023, regarding the implementation of a vote by mail system. SB2292 / SB3015 Enacts voting by mail uniformly across all counties for all elections commencing in 2020. Establishes a limited number of voter service centers that would remain open from the tenth business day preceding an election through the day of the election to receive personal delivery of mail-in ballots, accommodate voters with special needs, offer same day registration and voting, and provide other election services. Allows for additional places of deposit for personal delivery of mail-in ballots. Appropriates funds for the implementation and administration of the election by mail program. Requires the office of elections to submit a report to the legislature prior to the convening of each regular session from 2019 through 2023, regarding the implementation of a vote by mail system. Takes effect on 1/1/2020. SB2044 Ensures participation of all political parties on the Reapportionment Commission by providing that if there are no members belonging to a minority party in a house of the legislature, the presiding officer of the respective house of the legislature, after consulting with the chair of a minority party, shall be given the authority to designate persons who are members of a minority party to serve on the reapportionment commission. HB2420 Establishes restrictions on the participation in political activities of certain state employees and officers. HB1854 / HB1738 / SB2142 Amends the lobbyists law to eliminate outdated references to criminal violations and to clarify that the State Ethics Commission may require payment of an administrative fine or restitution pursuant to a settlement agreement. HB2444 Provides for instant runoff voting for all elective offices. Learn more about the need for and how to take action in support ofModern Elections Hawaii here. HB2652 / SB2578 / SB3092 Requires the office of information practices to resolve all public complaints about noncompliance with chapter 92F and part I of chapter 92 within six months from the date the office of information practices receives the complaint. HB1734 Requires each chamber of the legislature to establish rules that enable oral testimony through audiovisual videoconferencing technology. Appropriates funds for audiovisual technology in conference rooms. Bills that aim to cloud our Sunshine a.k.a. Open Meetings Laws. HB1793 / SB2161 Amends the Sunshine Law, part I, chapter 92, HRS, to clarify the ability of board members to attend and speak at community, educational, or informational meetings that are open to the public; and to provide that the limitation on the number of attendees shall not apply to members of a county council. HB2563 / SB3039 Proposes amendments to the Constitution of the State of Hawaii relating to the appointment and retention of justices and judges. Authorizes the senate to approve or reject subsequent terms of office for supreme court justices. Changes the required time frames from 30 to 90 days for the process to appoint and consent to a justice or judge. Harmonizes the senate consent procedures for district court judgeship nominees to mirror the senate consent procedures relating to supreme court justices and intermediate court of appeals and circuit court judges. In addition to bills we’ve identified that fall within our purview, we also keep an eye out for procedural issues, like “gut and replace” and “Frankenstein” practices. Using these questionable practices and shortcuts, decreases the opportunity for the public to weigh in, and for legislators to discuss and deliberate. Legislative session is fast paced. For more frequent updates, follow us onTwitter or like us on Facebook. If you’d like to help us by submitting testimony, please emailhawaii@commoncause.org for more information. Governor Ige signed HB165, which modernizes Hawaii’s Sunshine or Open Meetings law on June 29, 2017, officially becoming Act 64. Common Cause Hawaii and other community advocates were invited to the bill signing ceremony. The 2017 Hawaii State Legislative Session came to a close on Thursday, May 4, 2017. It was a mixed bag for good government reforms with both some wins and disappointments. Below are highlights of Common Cause Hawaii’s work. “Sunshine Law Modernization” –first major update to Hawaii’s Sunshine aka open meetings law in 20 years. Campaign Finance – The Campaign Spending Commission is the state agency that administers and enforces our state and local campaign finance laws. These bills were initiated by CSC and are considered “housekeeping” bills, and we supported these much needed updates. Also, the Campaign Spending Commission’s general expenses will be funded by the general fund, and not the Hawaii Election Campaign Fund (HECF). The HECF is the trust fund that provides matching funds for Hawaii’s Publicly Funded (aka Citizen Owned) elections. This will be the first time in about a decade that the HECF will be used for the exclusive purpose of publicly funded elections. This ensures the future of both the Campaign Spending Commission and Clean Elections program. The following bills are supported by the Ethics Commission. We supported these long overdue updates to our ethics laws. Protecting our Fair and Impartial Courts – We are proud to have had a hand in stopping the following legislation that if passed would have threatened the independence of our court system. HB1186/SB328 Proposes a constitutional amendment to amend the timeframe to renew the term of office of a justice or judge and require consent of the senate for a justice or judge to renew a term of office. Voting modernization –In 2017 Hawaii was named as the state with the lowest voter turnout, for the 5th consecutive presidential election. We need to reduce barriers to voting and make it more convenient and accessible for everyone to make their voices heard. For the past several years we have been supporting Vote By Mail and Automatic Voter Registration. Both reforms have been shown to increase voter turnout in states across the country. SCR108 SD1 “Automatic Voter Registration Task Force.” Requesting the Chief election Officer to Convene an Automatic Voter Registration Task Force to explore the Feasibility of Establishing and Implementing an Automatic Voter Registration System in Hawaii. The final 2 weeks of April are quickly approaching, which means the start ofConference Committee. This is when the Senate and House work out the differences between bills as only 1 version can be sent to the Governor for consideration -the final step to becoming law. No public testimony is taken during this time. Below is a short list of some of the bills that we are watching during this period. The following are bills supported by the Campaign Spending Commission, to update various sections of the State’s campaign finance laws. These are considered “housekeeping” bills, but are important and we support them. The following bills are supported by the Ethics Commission. We support these long overdue updates to our ethics laws. We have just passed the half-way point for the 2017 Hawaii State Legislative Session! Many bills did not meet internal deadlines and are “dead” for 2017. However, because Hawaii follows a biennial schedule, these bills could be “resurrected” in 2018. Please review the list below to see how our bills are faring. HB292/SB460 Requires an application for voter registration to be part of the applications associated with the issuance of a civil identification card under section 286-301 and a driver’s license under section 286-109. While the AVR bills are dead for 2017, thanks to public support, we were able to get resolutions introduced in both chambers. SCR108 / HCR116, HR70. If passed the resolution would form an AVR task force which would bring together various government agencies (Office of Elections, Dept of Transportation, county DMVs, etc.) to review current procedures, determine the feasibility, cost savings, and cost of impact of implementing AVR, and propose AVR legislation. This may not seem like a big deal, but communication between the agencies has been spotty at best on AVR and this will help us address some logistical issues which will help improve implementation once passed. Voting By Mail: Under this program, elections would be conducted by mail. However Service Centers will be located across the state for those who prefer to vote in person, need assistance, or needed to register to vote (thanks to Same Day Registration in 2018). There were various versions of VBM introduced, but the bills have been narrowed down to 1 vehicle from each chamber. Legislative Broadcasts: Legislative hearings provide valuable information, but are held during business hours, making it difficult for people to participate. HB98 Clarifies the fair treatment law by delineating limitations placed on persons who are task force members from those placed on legislators who are task force members. Clarifies that legislators are not prohibited from making statements or taking action in the exercise of their legislative functions. HB443 Creates a comprehensive public funding program for candidates for election to the state House of Representatives. Repeals those candidates’ eligibility for partial public funding under the existing partial public funding program. Appropriates funds to the Campaign Spending Commission. HB179 Establishes ranked choice voting for special election for Congressional races and for the election of council members in counties that have adopted the method. Establish video-conferencing mechanisms to allow citizens to submit live-oral testimony remotely: Legislative session is fast-paced, and public hearings are scheduled at a moment’s notice. Currently, only written testimony and live, in person testimony can be submitted. It becomes challenging for people who live and work outside of downtown Honolulu to participate in the lawmaking process (Ewa, Mililani residents, and Neighbor Island residents, we hear you). A video-conferencing mechanism would make it more convenient for citizens to productively engage in civic dialog with lawmakers on pressing issues they are concerned about. The Common Cause Hawaii Team scoured the over 1,900 bills that were introduced during the 2017 Hawaii State Legislative Session. Below are our top priorities and bills that are threats to our democracy. Automatic Voter Registration: This would register qualified individuals to register to vote, unless they decline, when they apply for or renew their driver’s license or state ID. Voter registration would also be electronically transferred from the licensing agency to elections officials for processing (rather than paper forms). Voting By Mail: Under this program, elections would be conducted by mail. However Service Centers will be located across the state for those who prefer to vote in person, need assistance, or needed to register to vote (thanks to Same Day Registration in 2018). HB291/SB459 Requires elections by mail, beginning first with certain counties in the 2018 primary election, until the 2022 primary elections, when all elections are to be by mail. Clarifies the election laws to provide for elections by mail, including defining “absentee voting” and “election by mail”, and stating how absentee ballots are to be prepared for counting and how and when the ballots are counted. Legislative Broadcasts: Legislative hearings provide valuable information, but are held during business hours, making it difficult for people to participate. This bill would require all public hearings and informational briefings to be recorded, to be stored in a public archive. HB416/SB156 Requires the legislative broadcast program to make an audio or audiovisual recording of all public hearings and informational briefings held at the State Capitol, and maintain an archive of the recordings to be made available to the public. Appropriates moneys. Public Funding for House of Representatives: A public funding option for the brave souls running for a House of Representatives seat would give political candidates (both new and incumbents) a choice to spend less time fundraising, and instead to spend that time working with constituents and solving problems. This plan would let political candidates who “opt-in” to the program, break their dependence on big dollar contributors by providing them with enough public money to run competitive races for office. Ranked Choice Voting (RCV): sometimes known as Instant Runoff Voting, describes a voting method that allows voters to rank candidates in order of preference and then uses those rankings to elect a candidate who combines strong support with broad support by simulating a series of runoff elections in the event that no candidate receives a majority of the votes in the initial count. HB1547 Establishes the Remote Testimony Task Force to develop procedures to make available remote testimony technology throughout the State that enables the public to testify remotely via the Internet during legislative proceedings. Legislature to adopt rules to establish remote testimony capability. Makes an appropriation. HB315/SB455 Amends conditions under which two or more members of a board may attend an informational meeting or presentation on matters relating to official board business. Allows members of a county council to attend such meetings or presentations without limitation on the number of attendees. HB327/SB480 Allows any number of County Council members to attend informational meetings or presentations on matters relating to official board business. Allows two or more members of other boards, but less than what would constitute a quorum, to attend a community meeting open to the public. HB1/SB673 Proposes amendments to the Constitution of the State of Hawaii relating to the appointment and retention of justices and judges. Authorizes the senate to approve or reject subsequent terms of office for justices and judges. Changes the required time frames from thirty to ninety days for the process to appoint and consent to a justice or judge. Harmonizes the senate consent procedures for district court judgeship nominees to mirror the senate consent procedures relating to supreme court justices and intermediate court of appeals and circuit court judges. HB1189/SB251 Establishes an exemption from the prohibition against using election campaign funds to make charitable donations or to award scholarships during the period from the filing of nomination papers to the date of the general election, for candidates who are already declared elected to office after running unopposed in an election. HB31 Repeals the standards (1) requiring a liberal interpretation of the state ethics code; and (2) allowing determinations of gifts law violations under the state ethics code based upon an inference of impropriety, to instead require a finding of actual intent to influence the recipient of the gift. Requires state ethics commission advisory opinions to be approved and signed by a majority of the commission members. Requires that 2 of the 5 members of the state ethics commission be appointed by each chamber of the legislature. In 2016, Common Cause Hawaii’s legislative strategy was “defense” heavy, while still advocating for bills that would have reformed our government and democracy further. Legislative session has ended, and with it, the death of many bills that would have compromised our democracy. HB 1532 / SB 2080 – Protects from public disclosure the financial disclosure statements of the UH Board of Regents that are filed with the State Ethics Commission. Included: HB 1644 – Permits members of a county council to jointly attend and speak at a community, educational, or informational meeting or presentation; provided the meeting or presentation is open to the public. SB 2239 – Proposes a constitutional amendment to require justices and judges be elected to serve six-year terms and be subject to the consent of the senate for subsequent judicial terms, authorize the governor and chief justice be authorized to make interim appointments for vacancies in the offices of the chief justice, supreme court, intermediate appellate court, and circuit courts, or district courts, respectively, and repeal the judicial selection commission. Ratification upon general election of 2018. Bills that would have undermined the Ethics Commission and exempt state employees from portions of the state ethics laws. While Common Cause Hawaii’s reform bills did not ultimately survive the session, we are proud that these nasty bills were defeated. With the defeat of these bills, public trust in government has been preserved which is key to increasing civic participation. HB 2156 / SB 2438 – Replaces the Hawaii election campaign fund with the general revenues of the State as the funding source for the operating expenses of the campaign spending commission. Appropriates moneys to the commission for operating expenses. HB 1595 – Establishes the Remote Testimony Task Force to develop procedures for the public to testify remotely via the Internet during legislative proceedings. Requires a report. HB1652 + HB 401 establishes this streamlined voter registration process where the DMV “automatically” registers eligible voters to vote, while allowing them the opportunity to opt out of the process if they so choose. Reverses legislators’ exemption of a portion of the state ethics code that specifies that legislators cannot use their elected title for personal gain. Sometimes known as Ranked Choice Voting (RCV), describes a voting method that allows voters to rank candidates in order of preference and then uses those rankings to elect a candidate who combines strong support with broad support by simulating a series of runoff elections in the event that no candidate receives a majority of the votes in the initial count. HB 2019 – Establishes instant runoff voting procedures for elections in which no primary election is held and for special elections. Hawaii is one of a handful of states left that still requires a person’s full social security number in order to register to vote. We advocate for the best practice in requiring only the last four digits of one’s SSN if one’s driver’s license or state ID number is not readily available. HB 1055 – Requires on an application to register to vote, a Hawaii driver’s license number or a Hawaii state identification card number or, if no license or identification card has been issued, the last four digits of the applicant’s social security number. If the applicant does not have a social security number, requires the State to assign the applicant a unique number for voter registration purposes. HB 2552 – Creates a comprehensive public funding program for candidates for election to the state House of Representatives. Repeals those candidates’ eligibility for partial public funding under the existing partial public funding program. Appropriates funds to the Campaign Spending Commission. Read on to find out what Common Cause Hawaii’s priority bills are, along with what we’ll strongly support and oppose during the 2016 Legislative Session. Ensuring the viability of the Campaign Spending Commission and Hawaii’s Partial Public Financing Program: The Campaign Spending Commission is the watchdog state agency that works to safeguard the integrity and transparency of state and local political campaigns in Hawaii.Partial Public Financing is a voluntary program, where qualified candidates running for elective office raise small amounts of money from the public which the state then matches, up to a certain amount. Both the Commission and the Partial Public Financing Program are funded by the Hawaii Election Campaign Fund, which is overburdened and now in danger of being depleted, jeopardizing the future of both the Commission and the Partial Public Financing Program. Establish video-conferencing mechanisms to allow citizens to submit live-oral testimony remotely: Legislative session is fast-paced, and public hearings are scheduled at a moment’s notice. Currently, only written testimony and live, in person testimony can be submitted. It becomes challenging for people who live and work outside of downtown Honolulu to participate in the lawmaking process (Ewa residents, and Neighbor Island residents, we hear you). A video-conferencing mechanism would make it more convenient for citizens to productively engage in civic dialog with lawmakers on pressing issues they are concerned about. Automatic Voter Registration: This is a process by which the government, rather than the individual, takes the initiative to register eligible voters to vote; the government uploads information on eligible voters obtained through its agencies and then registers them to vote, allowing them the opportunity to opt out of the process if they so choose. SB 2165 – Requires that any person who is eligible to vote and applies for a new or renewed motor vehicle driver’s license, provisional license, instruction permit, or identification card shall be automatically registered to vote if that person is not already registered to vote; provided that the applicant did not affirmatively opt-out of automatic voter registration on the application form. Fair Treatment: Reverses legislators’ exemption of a portion of the state ethics code that specifies that legislators cannot use their elected title for personal gain. Last 4 Digits of a Social Security Number: Hawaii is one of a handful of states left that still requires a person’s full social security number in order to register to vote. We advocate for the best practice in requiring only the last four digits of one’s SSN if one’s driver’s license or state ID number is not readily available. HB 1055 – Requires on an application to register to vote, a Hawaii driver’s license number or a Hawaii state identification card number or, if no license or identification card has been issued, the last four digits of the applicant’s social security number. Vote by Mail: It is important that methods of empowering the voting public be maximized to counter the perceived voter apathy and other factors that have led to a decrease in voter participation in recent years. We believe that “Vote-by-Mail” establishes that goal in numerous ways; the first of which being the basic voter preference for Vote-by-Mail (VBM). 83% of the early voters from the 2014 Hawaii primary election opted to vote by mail-in absentee ballot! SB 2116 – Incrementally phases in statewide elections by mail by the 2022 primary election. Assigns responsibilities between the State and counties for expenses related to mail elections for federal, state, and county offices. Requires clerks to send qualified voters their ballots forty-five days before an election. Establishes standards regarding hours of operation for absentee polling places. Specifies procedures for the counting of ballots. Makes an appropriation. Instant Runoff Voting: Instant Runoff Voting (IRV), sometimes known as Ranked Choice Voting, describes a voting method that allows voters to rank candidates in order of preference and then uses those rankings to elect a candidate who combines strong support with broad support by simulating a series of runoff elections in the event that no candidate receives a majority of the votes in the initial count. HB 1644 / SB 2121 – Permits members of a county council to jointly attend and speak at a community, educational, or informational meeting or presentation; provided the meeting or presentation is open to the public. SB 2221 – Allows for county council members to jointly attend and speak at particular types of meetings. SB 2238 – Makes conforming amendments to implement a constitutional amendment that establishes judicial elections. Requires the judiciary, office of elections, and campaign spending commission to study appropriate methods of implementing a judicial election system in the State and submit a written report, including proposed legislation, to the legislature. On Opening Day, then Senate President Kim boldly announced the Senate’s intention to pass a vote-by-mail (VBM) bill, which would have encouraged the majority of voters to cast their ballot through a mail-in absentee form. While a good idea, the VBM bills that progressed through the Legislature were used as vehicles to repeal Late Voter Registration (LVR), which is slated for implementation in the 2016 elections. Good government advocates were unwilling to support a VBM bill at the expense of losing LVR. We were pleased to see that the remaining VBM bill, which included language to repeal LVR, was deferred in the final hour. Updates the State Ethics’ Commission’s filing platform so that all reports filed with the Ethics Commission – including lobbyist expenditure forms, and public financial disclosure statements from elected officials and certain board and commission members – will be accessible via a new data system making it easier for citizens to conduct online search enquiries, and extract such data for their own analysis. Makes campaign spending from super PACs more transparent by creating an additional filing for them. In the 2014 election cycle, Hawaii saw an unprecedented amount of “big money” influencing our elections. As Election Day neared, many voters were curious and concerned about who these special interests were. SB508 addressed a gap in super PAC reporting, and shines a light on those special interest groups who attempt to sway voters. Common Cause Hawaii is pleased to announce our priority bills for the 2015 Legislative Session. The bills listed below are initiated by Common Cause Hawaii. Note: There might be similar bills that have been introduced that have similar objectives. Updates the existing partial-public funding formula by: increasing the maximum amount of public funds made available to candidates running for governor, lieutenant governor, or mayor so they cannot exceed 50% of the established expenditure limit for each election; increasing the matching funds provision. Requires all lobbyist statements to be filed with the state ethics commission electronically using a webform mechanism. Allows voters the option to rank candidates as the voter’s first, second, and subsequent choices, instead of voting for a single candidate. Provides instant runoff method of voting for all partisan primary elections, special elections, and nonpartisan general elections held in Hawaii. Broadcasting/webcasting/recording, and archiving of all hearings. *Although we initiated a partial public funding improvement bill, we are still committed to strongly supporting a full public funding program. Electronic filing for all reports filed with the Ethics Commission (HB826) — Appropriate funds to the state ethics commission to design and develop a system that allows filers to electronically file required statements and reports with the state ethics commission. Videoconferencing (HB1054) — Requires the House of Representatives to implement rules for a pilot program to enable the house to receive live oral testimony from the County of Hawaii through audio or audiovisual technology. Requires consultation with the County of Hawaii, the chief information officer, and the Disability and Communication Access Board. Sunshine Law for legislators – This bill would require the Legislature to adhere to fundamental principles of the Sunshine Law. Within this bill, our Legislature would be required to give a seventy-two hour public notice for public hearings. They would also be required to consider correspondence on measures to be considered testimony. Fair Treatment Code — Reverses legislators’ exemption of a portion of the state ethics code that specifies that legislators cannot use their elected title for personal gain. Releasing ballot results prematurely (HB612)– Make it illegal to release ballot results before all polling places are closed. Evaluation of Chief Elections Officer — Requires the elections commission to conduct a performance evaluation of the chief election officer. Informed voting (SB509) — The attorney general to prepare a statement for each proposed constitutional amendment in plain English that indicates the purpose, limitations, and effects of the proposed amendment. The Office of Elections will be required to publish this information wherever they make proposed constitutional amendment questions available to the public. Voter registration: last four digits of SSN/Drivers’ License — Require only last four digits of SSN and/or person’s driver’s license/ state ID number for voter registration. …and several bills meant to update and strengthen our transparency and public access laws.